The California Office of Traffic Safety has released the 2013 update to its 2012 lane sharing survey (available on our resources page). The 2013 survey was again conducted by Ewald & Wasserman Research Consultants, using a similar methodology to the 2012 survey. The researchers surveyed a greater number of riders and drivers – 713 riders, compared to 560 in 2012, and 1,020 drivers, compared to 733 in 2012. Check out the first few pages of the survey below for the rest of the methodology – let’s get to the good stuff! There’s some good news about riders being hit or nearly hit, too. Fewer riders reported being hit by vehicle, although the number riders hitting other vehicles increased a bit. Bad! But the overall “never been hit” percentage is up. Of the riders who hit or were hit by a vehicle, the precent of “just hit a car mirror” reports increased from 34.6% to 46.2% in 2013. “Scraped/hit side of car” also increased from 7.4% to 11.5%. See the full breakdown of types of collisions in the full survey PDF below. There were some changes in lane splitting behavior on the freeway – more riders reported splitting in traffic up to 20 MPH and up to 40 MPH. The percentage of riders splitting in traffic up to 70 MPH more than doubled, increasing from 1.6% to 3.6%. Slow down, guys! There were not a lot of changes in the answers to questions regarinding splitting on roads other than freeways. As with splitting on freeways, the number of close calls decreased – 76.7% of riders answered “Did you ever nearly hit a vehicle?” with no, compared to 70.3% in 2012. In reported collissions, mirror hits off the freeway increased from 20% to 31.6% and a lot more riders were knocked down – 13.2% in 2013 versus 2.9% in 2012. However, the researches noted that even this seemingly large change was not statistically significant. The survey contains extensive data on riders’ speed relative to surrounding traffic – see tables and notes starting on page 17. The researchers calculated average speed differential for road types as shown in the table below, and not surprisingly found that riders who split on freeways and roads tend to split more quickly. The researchers characterized the changes in the 2013 threat perception numbers as insignificant, saying “The small changes in the perception of most serious threat to motorcyclists between 2013 and 2012 are not significant.” One glaring issue here is that few riders perceive “big trucks” as a significant threat, while in reality the data shows these large vehicles as being positively murderous to lane splitters. In summary – most of the changes in the rider data from 2012 to 2013 was characterized by researchers as not statistically significant. Ok – so what about the drivers? The researchers characterized these small changes as statistically insignificant. Check out the tables starting on page 22 for more information on perceived legality by drivers. There was a bit of a reduction in the number of driver-reported lane splitting accidents, although the number of observations is small. Table V23 on page 29 breaks down driver reasons for approval/disapproval. The most significant reason for disapproval is “it is unsafe” at 57.5% followed by things like “it startles me” and “it might cause me (or others) to have an accident.” Surprisingly, complaints that seem common when lane splitting is mentioned in the media, such as “they ride too fast” and “it’s unfair” don’t carry much weight here. The tables beginning on page 30 display comprehensive breakdowns of perception of legality, approval/disapproval and regional opinions. Another big deal for riders is drivers blocking riders who are lane splitting. This is explicitly mentioned as illegal in the CHP lane splitting guidelines but unfortunately there is not a significant change in drivers blocking riders. As for why this small percentage of drivers do this, the “it’s unfair!” complaint shows up, with 11.6% of blocking drivers giving this as the reason they block lane splitters. 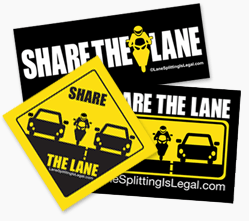 14.5% of blockers say they engage in this aggressive, dangerous behavior because lane splitting is unsafe. That’s right – these drivers think they should block riders with their car because lane splitting is unsafe. Similarly, 17.4% of blocking drivers said they try to prevent riders from lane splitting because lane splitting may cause them to have an accident. Cue head explosions here. In summary there isn’t a lot of good news here – it’s mostly neutral, with not a lot of statistically significant changes in the data. As mentioned above, the official PR engines of the CHP, OTS and DMV were just getting going as this survey was being conducted – hopefully we’ll see more positive results in the 2014 survey. In the meantime, riders should read the entire study and work to be good ambassadors for lane splitting and motorcycling in general. Please share this study with riders and drivers alike! Here’s the 2013 survey. If you can’t see the embed, click here to download the PDF. 1 Pings/Trackbacks for "2013 California Lane Sharing Survey Released by OTS"